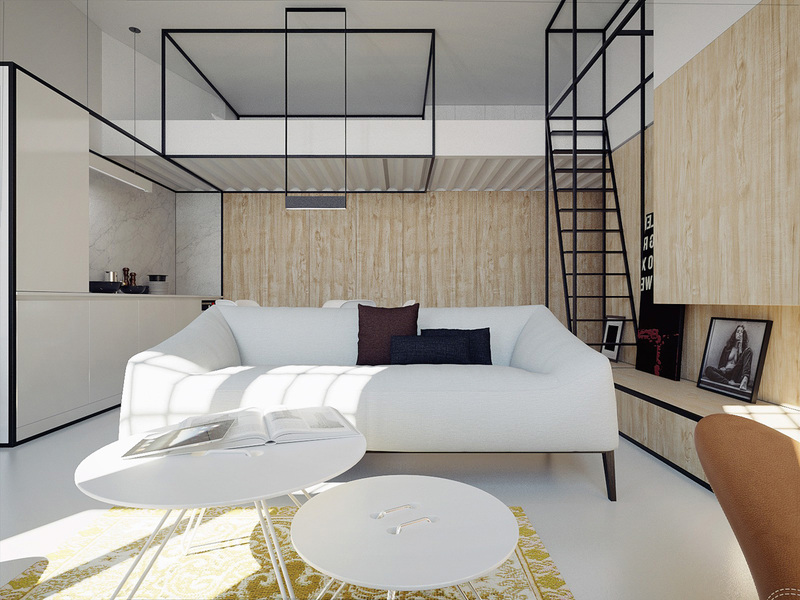 Mezzanine levels create extra space by floating a room within a room. 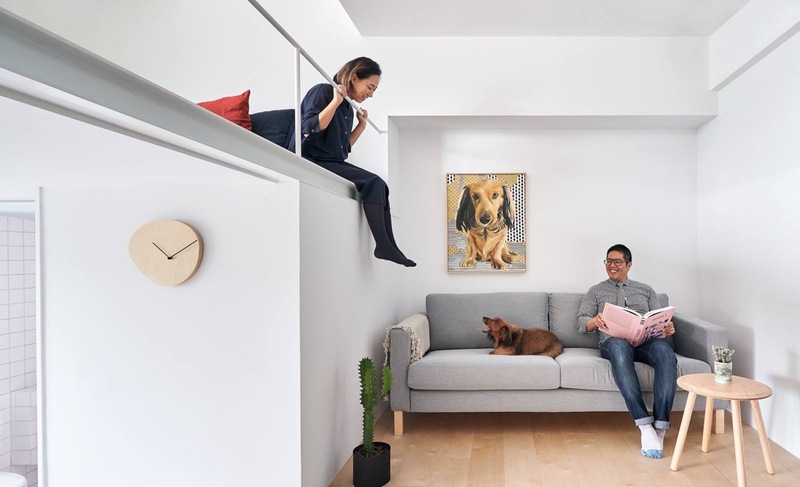 A mezzanine level’s midway position between floor and ceiling means that lofty dimensions can be utilised where space would originally have been wasted. 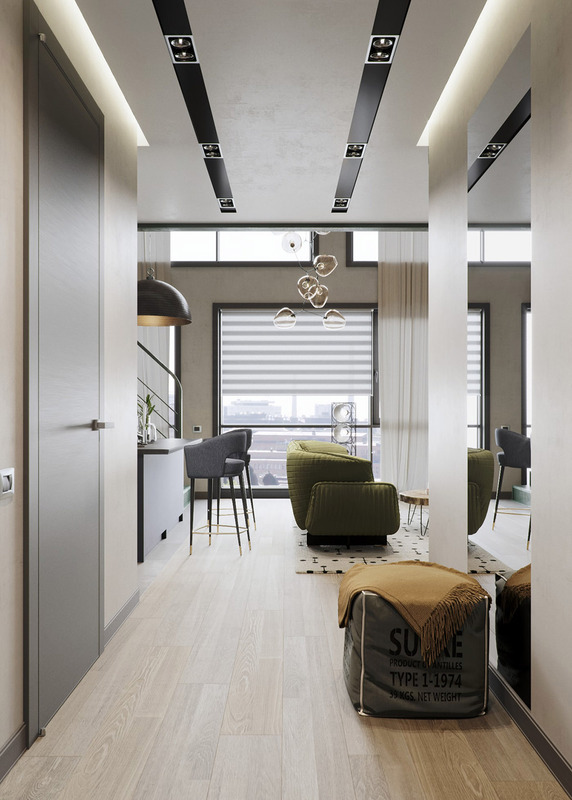 Vertical space that might not lend itself to being split between two entirely separate floors can play perfect host to a lofted bed, a mezzanine dressing room or a dedicated home office platform. 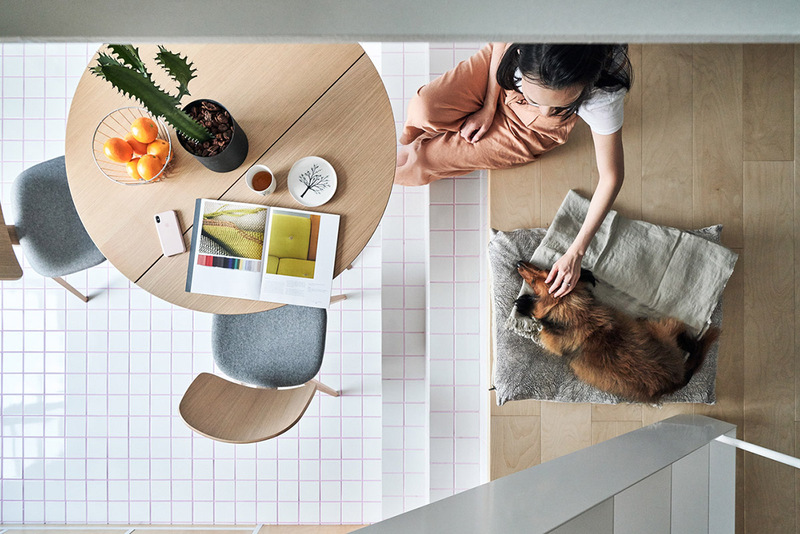 The space below the platform can then be used for another function, for living more spaciously, or create the opportunity to entertain company. 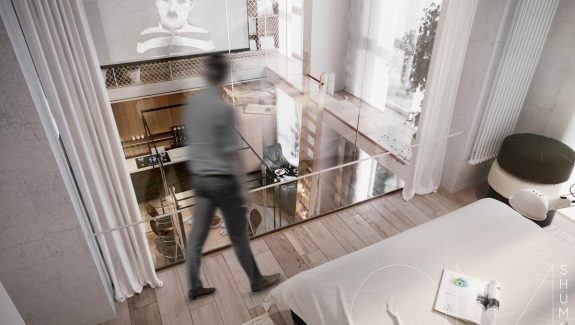 These three mezzanine designs each bring their own ideas to the platform - and to the rooms that reside beneath. Designer: Phoebe Sayswow Architects Ltd. 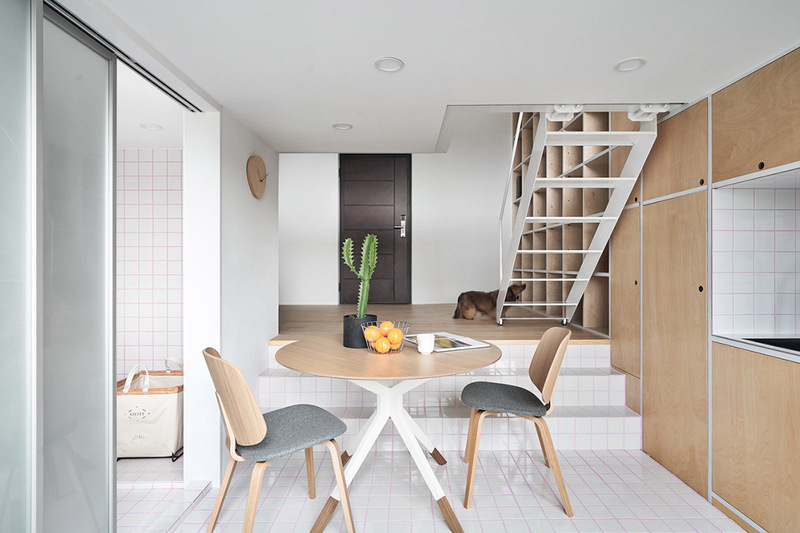 This is a micro flat that was completed in 2018, located in Muzha, Taiwan. 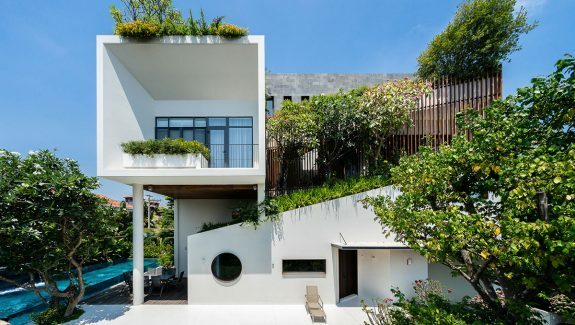 It measures just 33 square metres and has three different levels. A bedroom mezzanine level with a double bed overlooks a cosy living room. Steps from the lounge lead down a kitchen diner area and a bathroom. On entering the home, we’re met by the sight of towering windows that open out onto a small balcony overlooking the city. The windows climb the full height of the three levels in the home. The staircase to the bedroom mezzanine are open tread so as not to obstruct the flow of natural daylight. 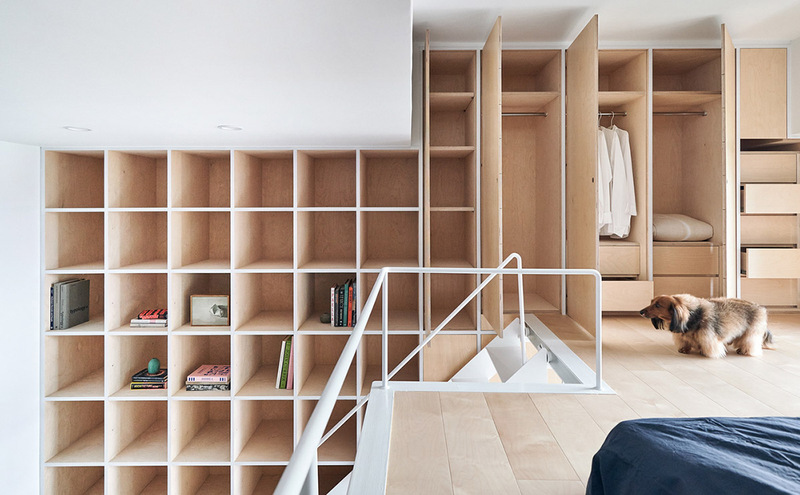 Bespoke storage shelves and cabinets climb from the entry floor all the way up the open staircase, morphing into closets as they enter the bedroom. The steps that lead down to a modern dining chairs and table set have been tiled to coincide with the bathroom decor, which also echoes the kitchen backsplash, creating one cohesive look. The very top dining room step is floored with wood laminate to provide a warmer surface on which to sit – as the top step can also double as banquette seating at the dining table. The grey, white and wood dining set is decorated with a cactus and fruit bowl centrepiece. 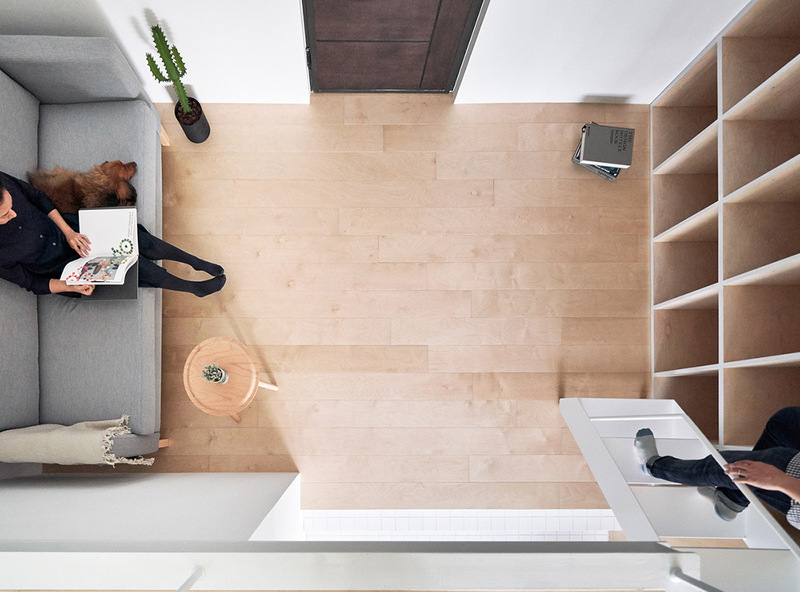 A birds-eye view over the lounge/entryway from the mezzanine level bedroom shows just how small the footprint is. 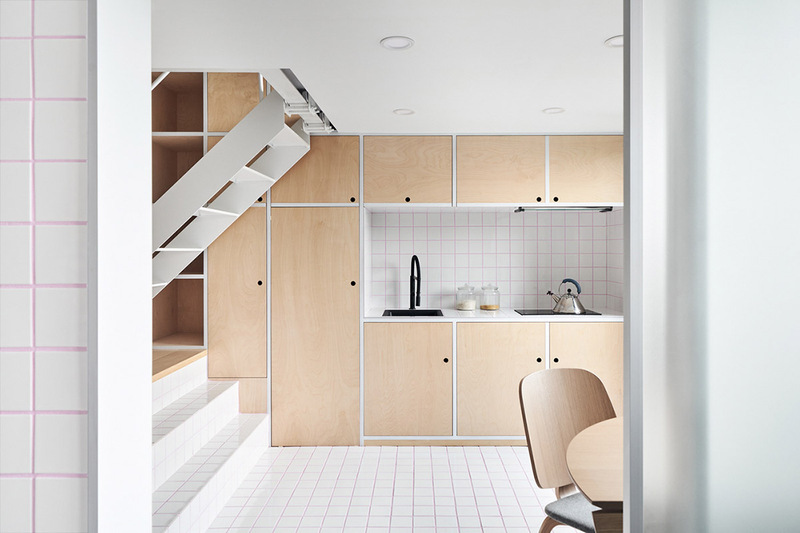 The small kitchen nestles snugly beneath the raised bedroom. 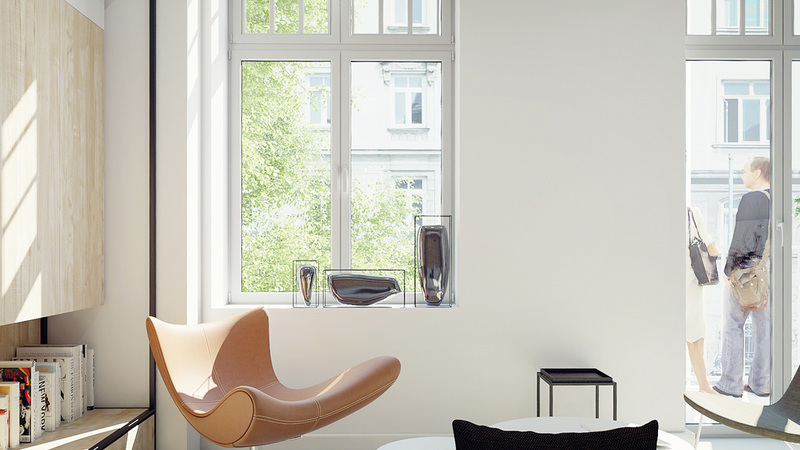 The built-in wall shelves make use of every single inch of wall space, both widthways and vertically. 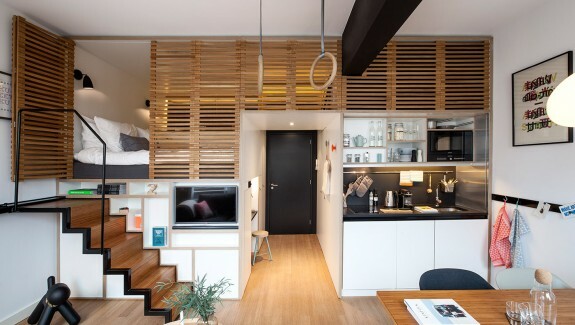 The continuity in material gives the tiny home a wider appearance. One single wall of storage has created stacks of home organisation opportunities. 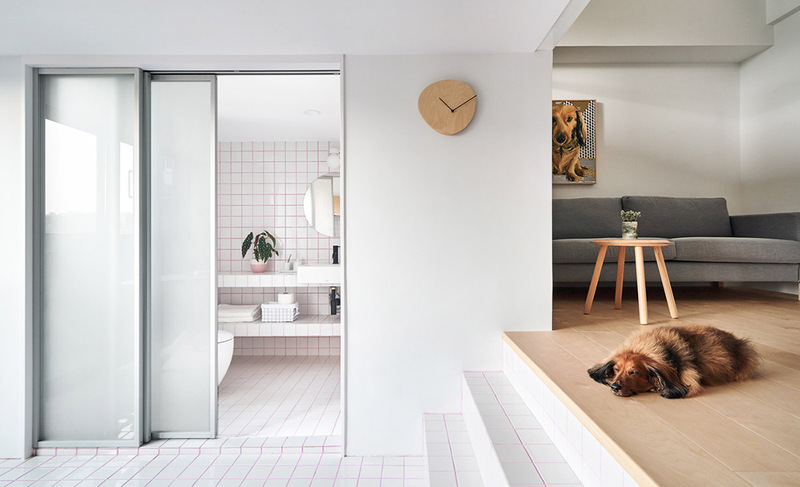 Space-saving sliding doors close off the bathroom. 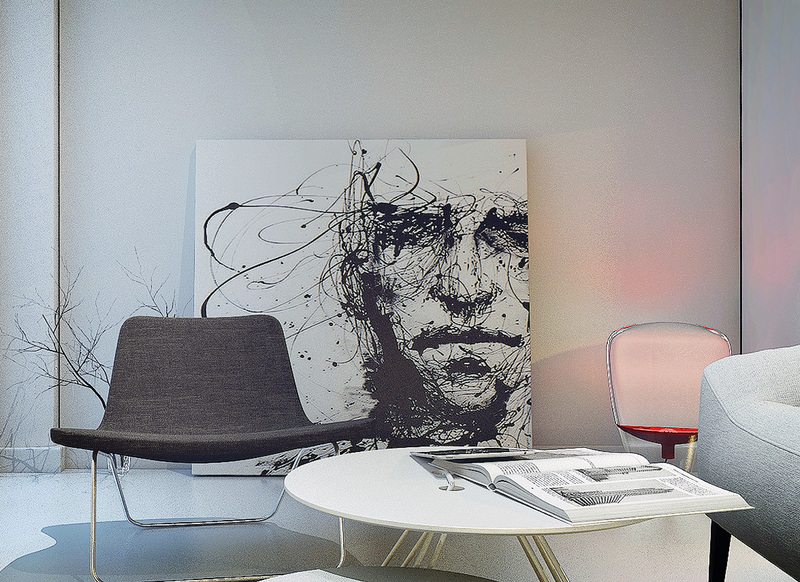 Fresh white walls help the flat feel more spacious. 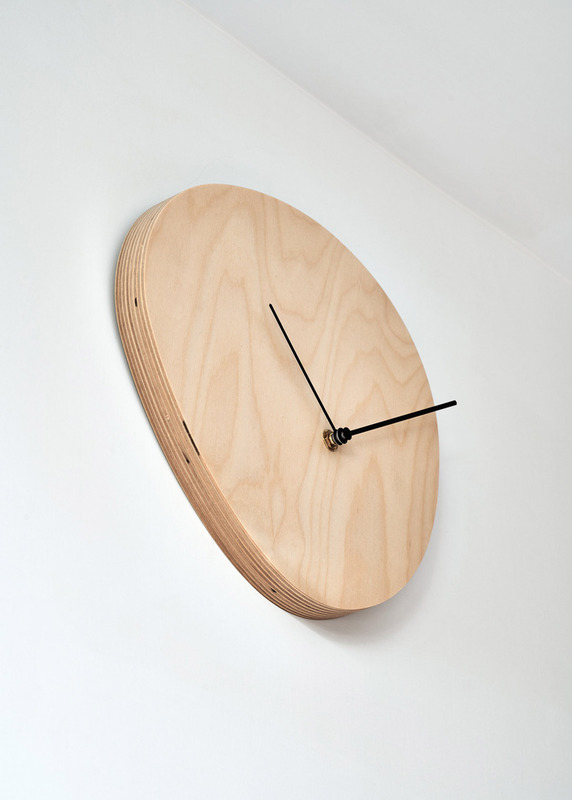 A unique wall clock adds a touch of wood tone. 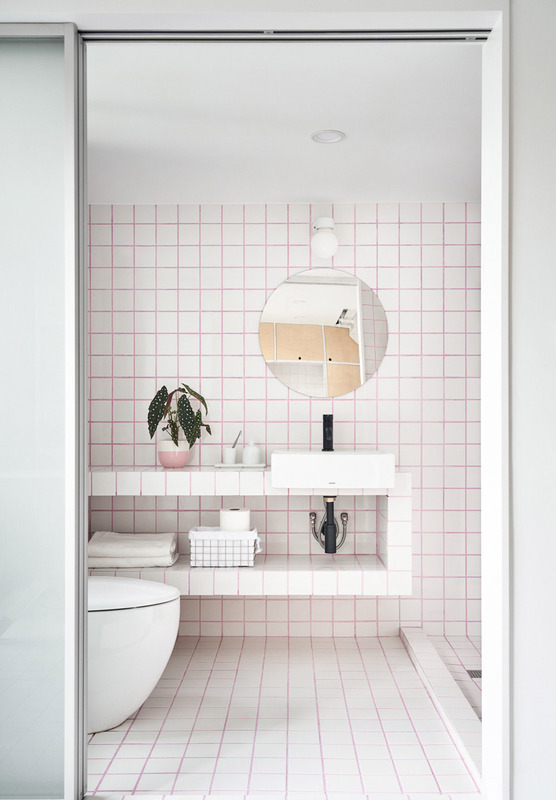 Pink grout adds character to the expanse of plain white tile. 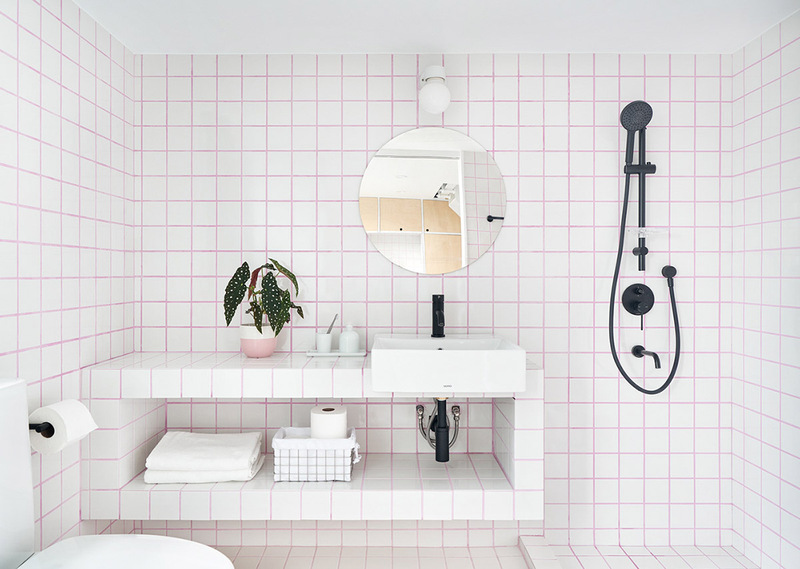 An indoor plant dresses the vanity shelf, potted in a pink and white planter. A round vanity mirror breaks up the angular bathroom decor theme, contrasting with the rectangular vanity installation and rectangular basin. 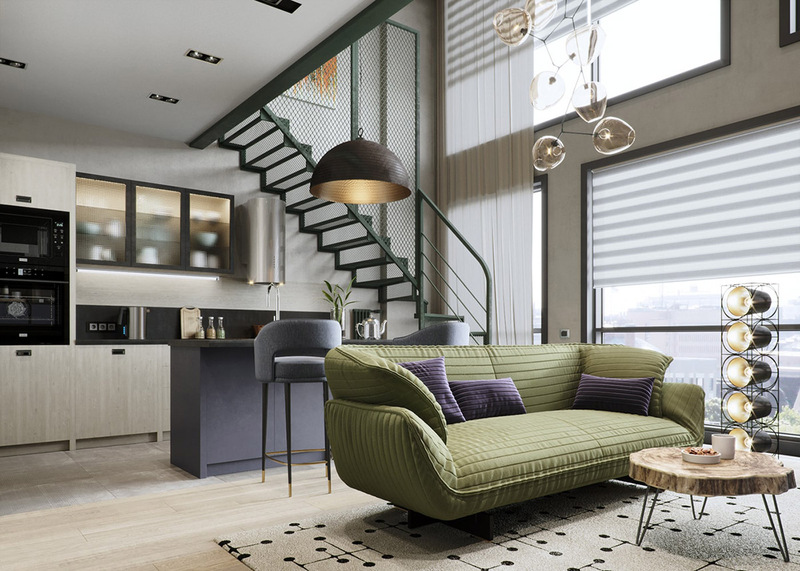 Our second home with a mezzanine level is a business-class apartment in Tribeca, Moscow. 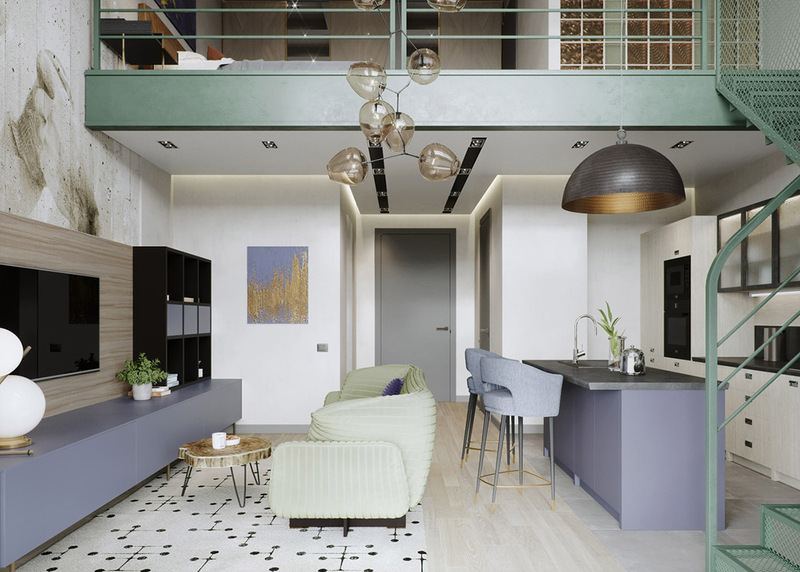 The loft style interior is a renovation in an old industrial complex. 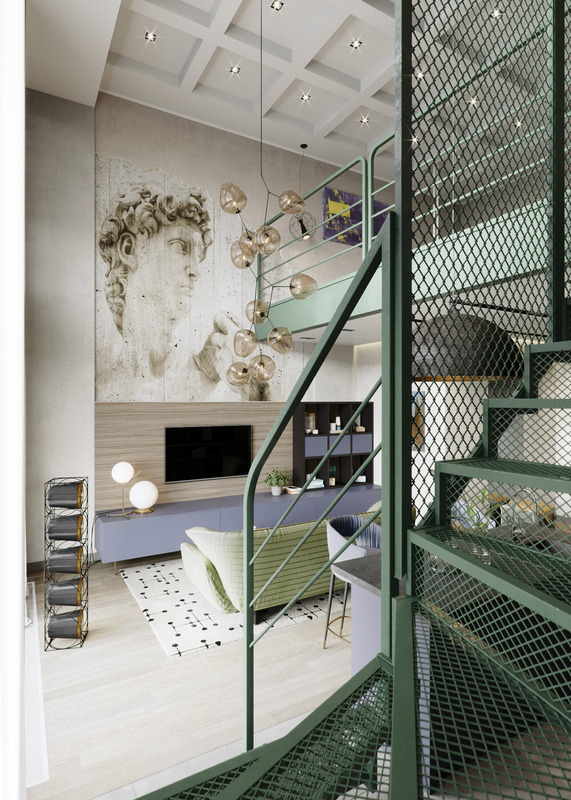 The industrial style staircase to the mezzanine level is testament to the industrial heritage of the building. The metal framework and mesh balustrades have been coated in a bold green finish to add character. 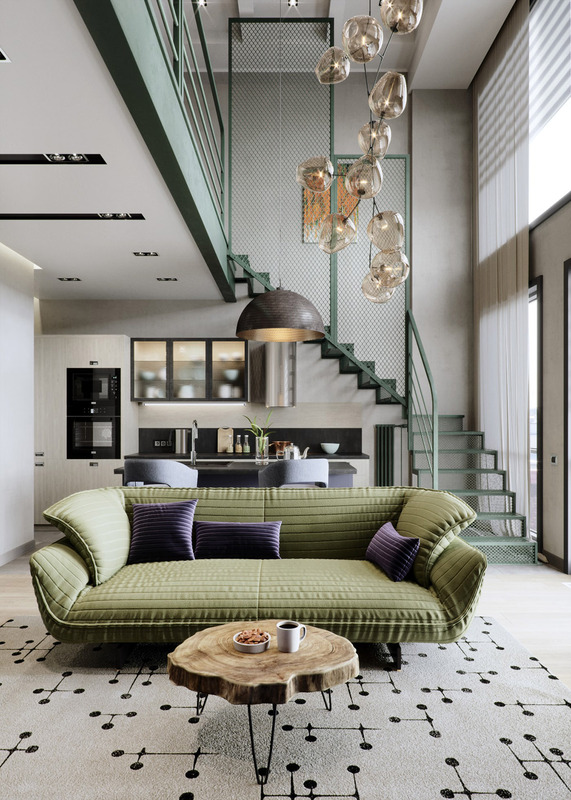 A green fabric sofa ties in with the colour. To go with the natural palette, the unique coffee table is what’s known as a Live Edge one, the likes of which you can get here. A long modern chandelier fills the upper half of the vertical space. 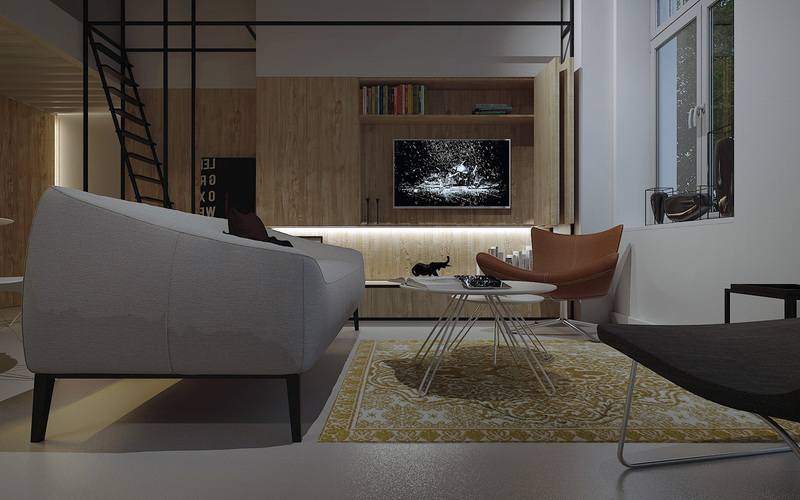 In front of the sofa, the television is mounted into a wall of media units. 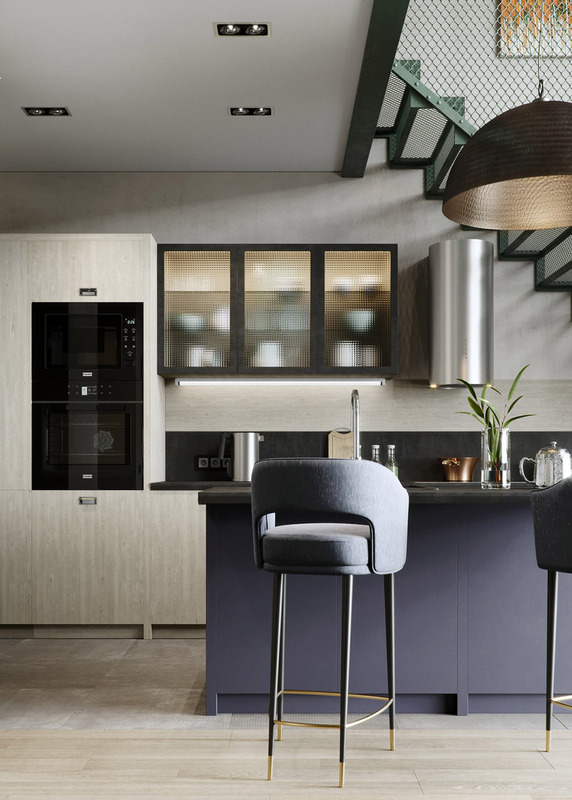 The Scavolini kitchen is a combination of light wood tone and black accents. A central kitchen island is teamed with gold tipped kitchen bar stools. 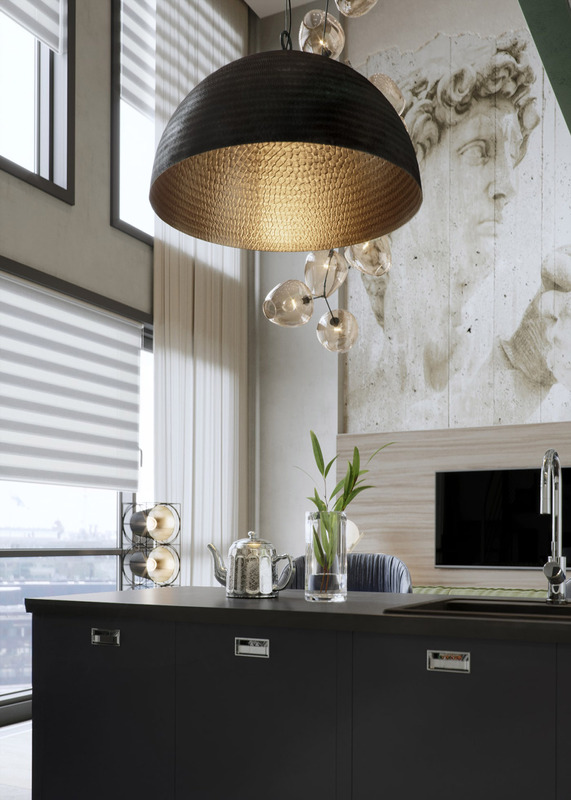 A huge gold and black kitchen pendant light is suspended over the kitchen island. A metallic teapot and a moderndecorative vase adorn the surface of the breakfast bar. 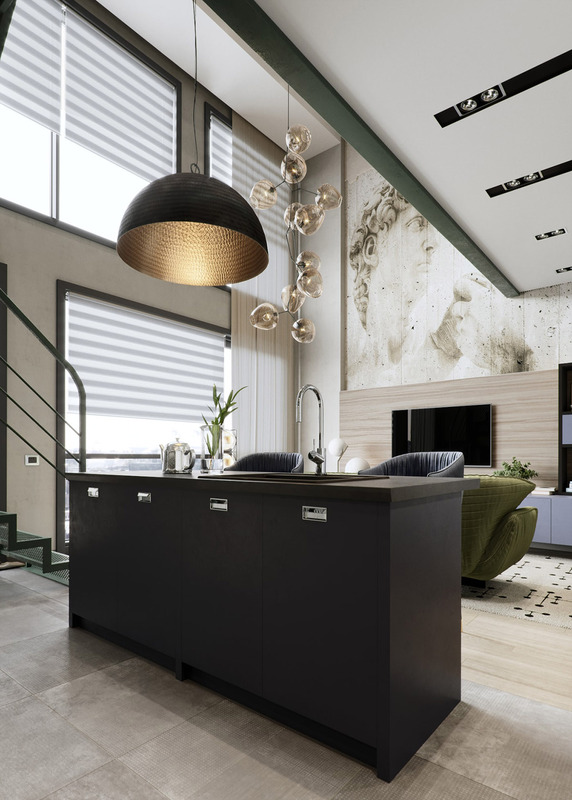 An amazing mural crowns the tv wall decor, reaching high toward the rafters so that it may also be enjoyed from the mezzanine level of the home. Dual level windows send natural light to both levels of the home. 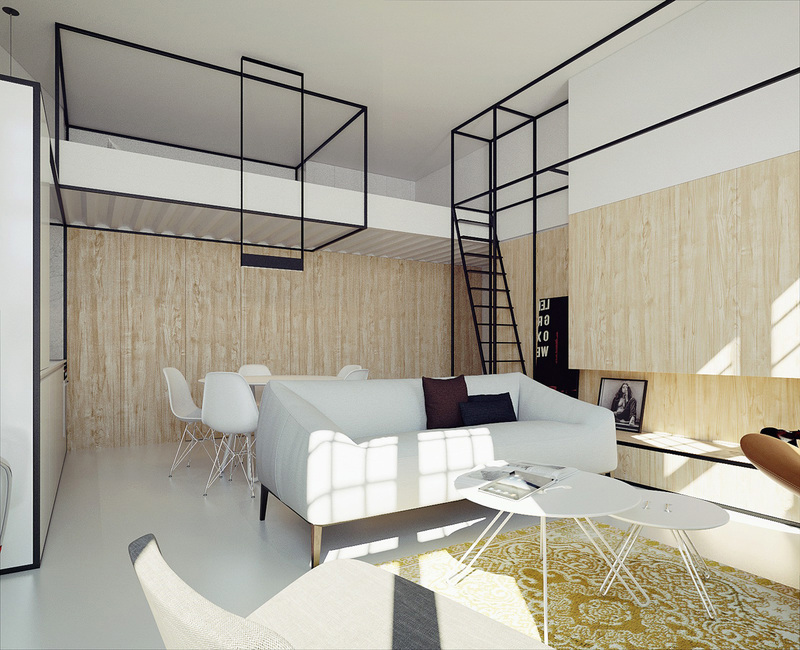 Our third and last home interior with mezzanine is an apartment with a great location in the Wawel, Krakow. 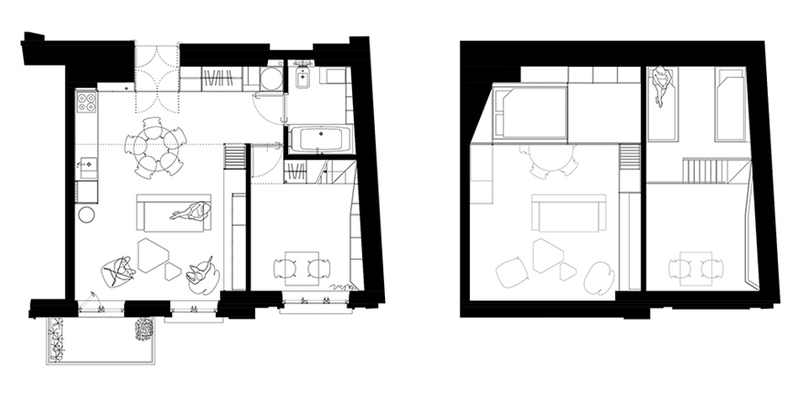 The small space was redesigned to be modern and functional, tailored specifically to the needs of the client. 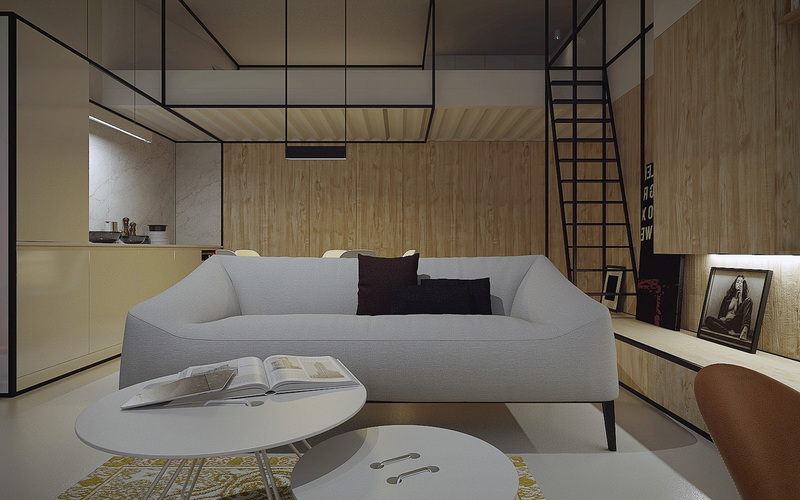 Space-saving built-in bespoke cabinets line one wall of the living room; nesting coffee tables mark its centre. 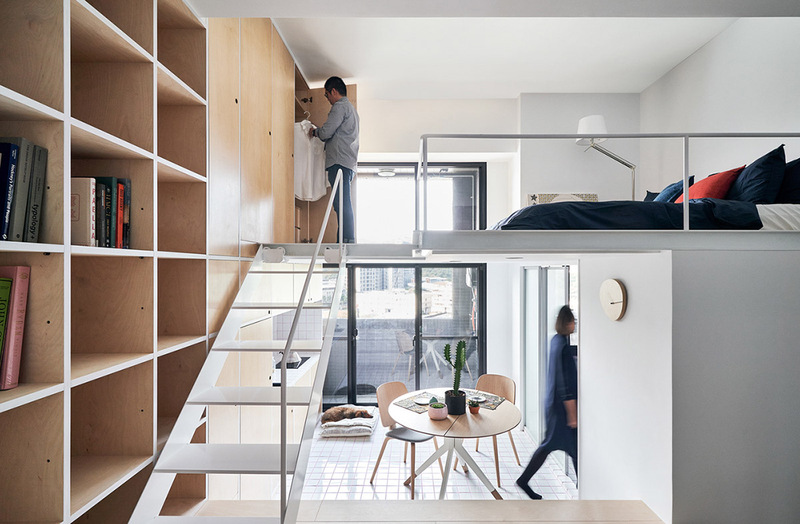 The compact home has a minimalist aesthetic. 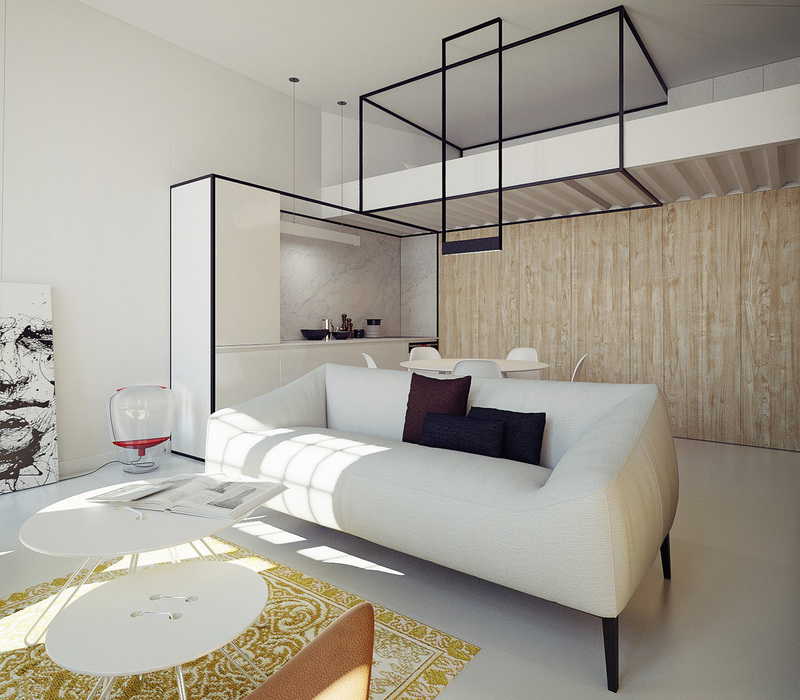 A white modern sofa, white floors and a white kitchen help open up the room. 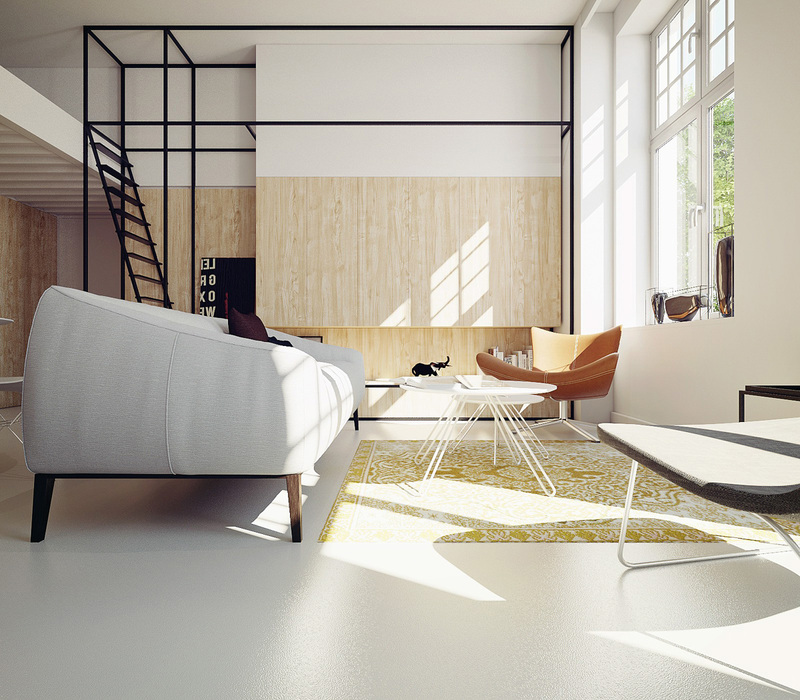 Unique black framing adds geometry and dimension to the plain white decor. A yellow area rug hums to the same tune as the light ash wood tone around the room. Cabinet doors retract to reveal a television and a hidden book collection. Strip lighting below the tv cabinet lights another bookshelf with an elephant figurine. Open tread steps lead up to the homes mezzanine level, echoing the other black skeleton shapes that levitate in the space. The beautiful art on display here is a stretched canvas version of Lines Hold The Memories by Agnes Cecile which you can get here. 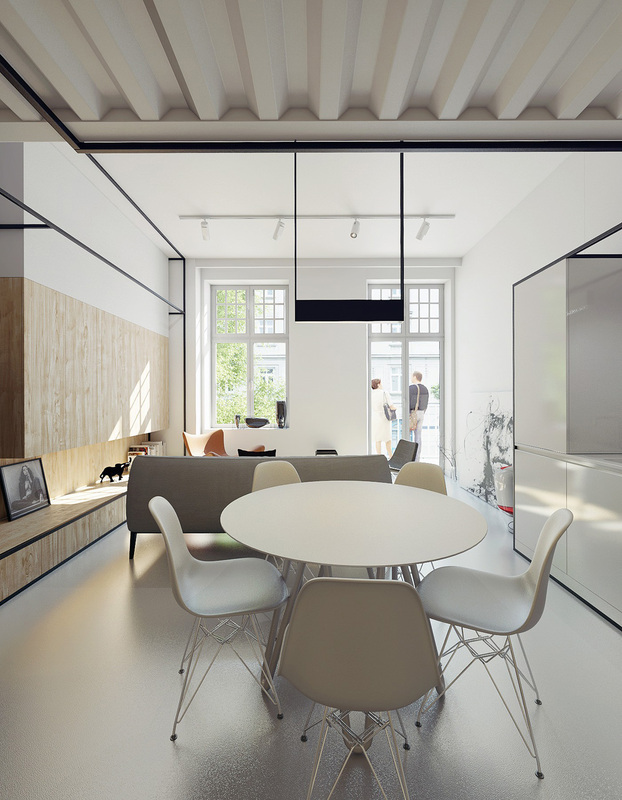 The black skeleton frames help to visually organise and emphasise elements in the interior composition. 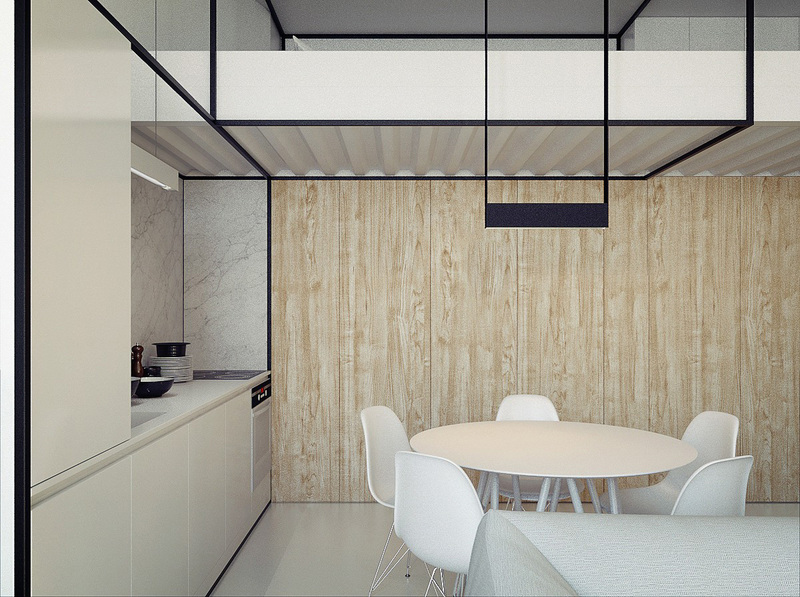 The careful layout of the small apartment allows for a formal dining area, furnished with a minimalist dining set. 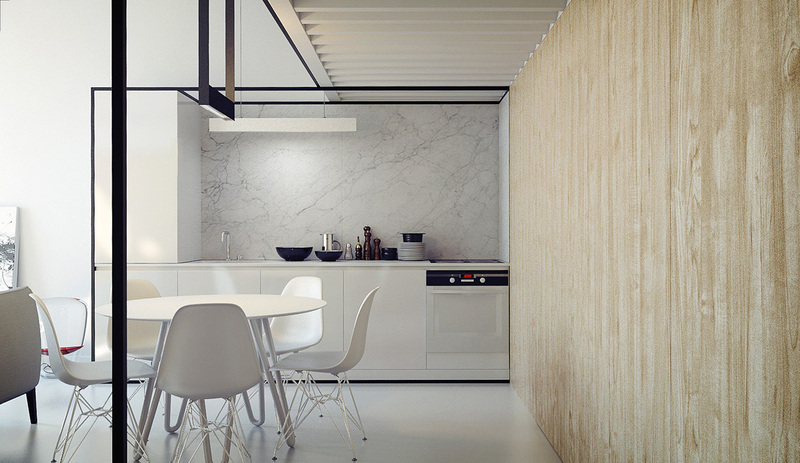 The one wall kitchen is backed with smooth white marble. 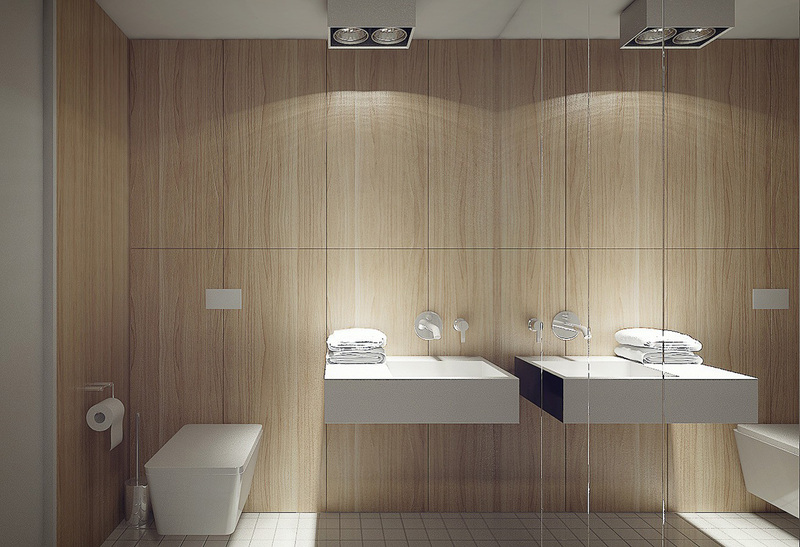 The white and wood tone decor continues in a minimalist bathroom. Separate from the open plan living room, we’re presented with a fun child-friendly zone. 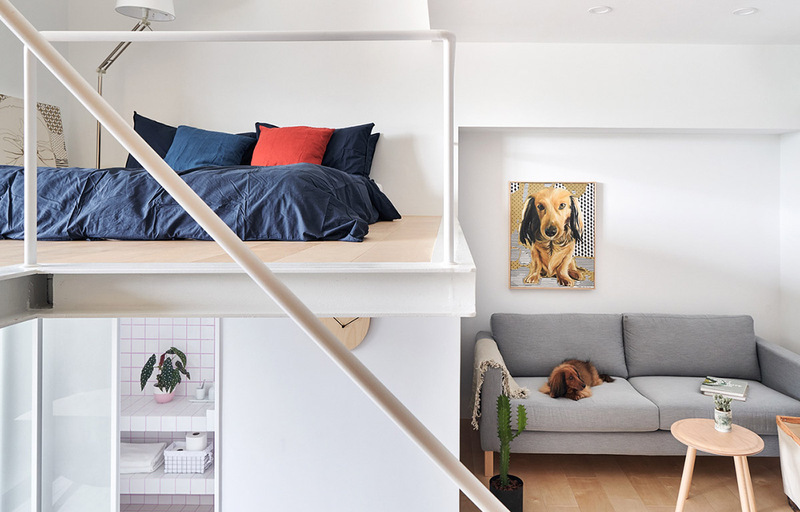 A mezzanine level resides in the kids’ room too, which holds two single beds. 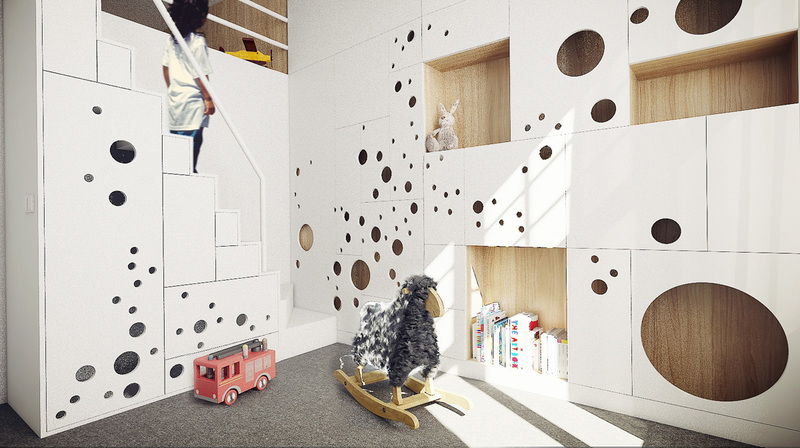 Towering stacks of storage units have circles randomly punched out of the cabinet doors to create a bubbly design. Recessed shelves climb between the cabinets to hold books and display much loved toys.